“The time spent setting up and installing printers at a local level was reduced to seconds instead of hours,” said a company representative. That’s what keeps contributing to such phenomenal ROI. How much of any construction company is built on paper? The contracts, the invoices, the schedules, the blueprints—so much essential business depends on a material renowned for its thinness than its space-age composition or load-bearing ratio. That’s why construction companies take their print environments so seriously, and an increasing number of them are growing dissatisfied with the frustrations and limitations of traditional print management solutions. The independent research firm TechValidate set out to speak with PrinterLogic customers in this field to determine how our forward-thinking print management solution was working for them. One TechValidate case study of a large-enterprise construction company (TVID: D85-5A7-005) shows just how effective PrinterLogic has been. The company recouped the entirety of its investment in PrinterLogic within six months. But the return on investment (ROI) didn’t end there. The total ROI has already amounted to more than 400%—a percentage that’s still climbing with every end user who installs his or her own printer without calling the service desk, or every hour that’s saved through PrinterLogic’s effortless print management. What’s even more astounding is that there were no expensive and problematic print servers to eliminate. This company had a direct IP print environment before implementing PrinterLogic. 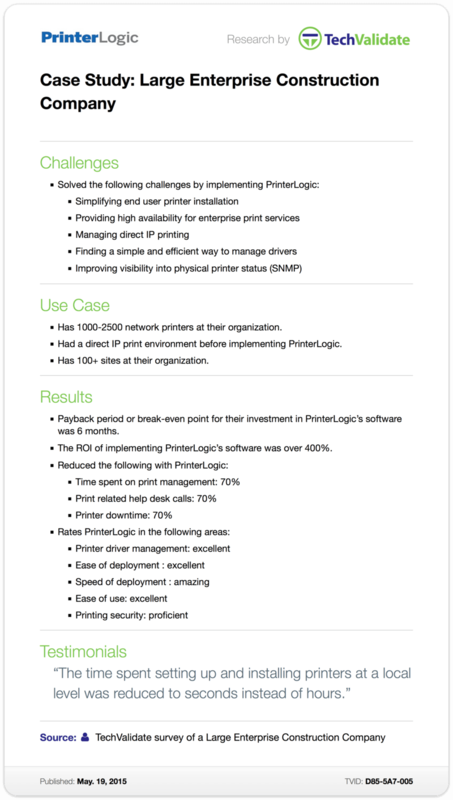 And yet the improvements the company experienced with PrinterLogic were so great that it still rated our solutions as “amazing” in speed of deployment and “excellent” in three separate areas: printer driver management, ease of deployment, and ease of use. Construction companies might be built on paper, but the really successful ones use PrinterLogic as their foundation.